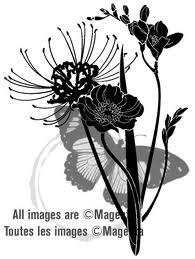 Introducing our FINAL Stamp of the Month, a gorgeous floral silhouette image by Magenta! In February 2003, over 10 years ago, I started featuring a SOTM at Creative Accents. My very first stamp was by Magenta so I thought it would be cool to finish off with a stamp by Magenta as well! Much has changed over the years, but Magenta is still a great Canadian company that produces beautiful rubber stamps! I look forward to creating with this one some more, but for now I have just one simple card to share with you (a tribute to how busy life is right now!). A copy of this stamp is in the hands of one of our faithful design team members, and between us we should have more samples to share with you soon! As you can see from this card, it's a perfect image in it's simplicity! 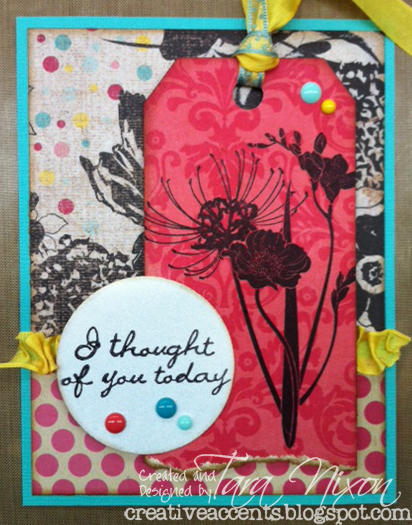 I've paired it with patterned papers by Glitz & Echo Park. The sentiment is an old fave, also by Magenta. This stamp is 35% off for SOTM members, no extras are available at this time... but we have lots of other great stamps in the store and they are ALL on sale as we work on reducing inventory! This is beautiful! Too bad there are no extras, I would have liked this one in my collection! Hey, lady, I will work hard this weekend to get some samples for you! Now if I could just remember which box my embossing powder is in, argh! Love what you've done here, and I can't believe it's the last one, booooo!